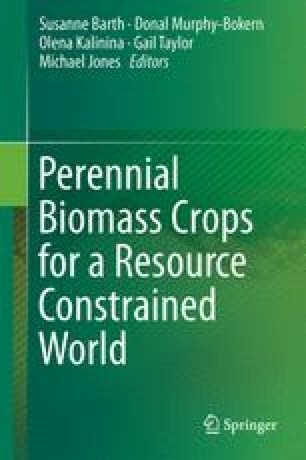 Growing energy demand, the need to reduce greenhouse gas (GHG) emissions and the move towards a low carbon economy are driving the development of non-food lignocellulosic crops to provide an alternative to fossil fuels and to support bioenergy with carbon capture and storage (CCS). Trees offer significant potential in this role. Poplar, willow and eucalyptus are suggested here as three target tree crops however, a significant yield gap (the difference between potential and observed yield) exists that may be as much as 10 tonnes ha−1y−1. New technologies offer great potential to accelerate the breeding pipeline and provide the bioeconomy with fast growing, stress tolerant and low-input bioenergy trees with higher potential yields and smaller yield gaps. These technologies include both genomic selection (GS) and genome editing, where significant progress for trees has been made in recent years. The most challenging remaining bottleneck is the accurate phenotyping of large populations of trees for traits that underpin yield; more research is required on target traits for the sustainable intensification of the production of bioenergy tree crops. We acknowledge support from the Seventh Framework for Research of the European Commission, for the project WATBIO (www.watbio.eu), project number, FP7-311929.